A FEW WEEKS AGO, MY BROTHER CALLED MY MOTHER TO talk about Thanksgiving. Now, this is unusual enough: My brother is the kind of guy who always shows up for holidays, but doesn't want to bother with the details ahead of time. Usually he gets in touch with us around mid-November to find out where the feast is being held, and before we can ask him to make a green bean casserole, he offers to bring the wine. But his no-frills approach to the holidays has changed this year. He's met the woman of his dreams, and suddenly family has taken on a whole new significance. Overnight, he's become the kind of guy who calls his mother in August to talk about the holidays. "Do you think we could have Thanksgiving in Eureka this year?" he asked her. "Uh" my mother replied, while wondering to herself, who is this kid? Jason lives in LA; Thanksgiving in Eureka means a 12-hour drive through the rain. "I figured this would be my big chance to show Amy's house to Rebecca," he continued. Rebecca is the woman responsible for this remarkable transformation. "I'm sure that would be fine," my mother said. "Amy always likes to have a chance to show off her garden." Flower Pots: A few well-placed containers can go a long way. I usually turn my nose up at dwarf bedding plants like pansies, petunias and marigolds because they are so short-lived, but this is no time to be picky. Stuff flower pots with orange, yellow, and red flowers, and pinch back the blooms to encourage bushier plants. 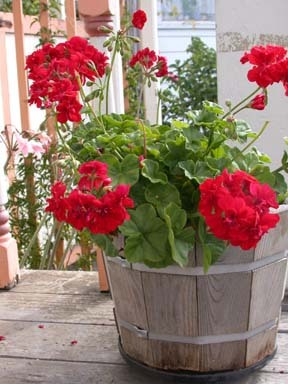 This is also a great time to plant some geraniums -- after the holidays, you can re-pot them and bring them indoors for winter, or plant them in the garden. Annuals: It's not too late to get some pretty impressive annuals going in the empty spots where summer flowers have faded. Cosmos, zinnia and sunflowers may still bloom later this fall if you plant them now. Icelandic and Oriental poppies planted in masses can put on an impressive show, and if you want them to bloom later you can get larger quantities by purchasing smaller, less expensive plants. Just be sure to dig in plenty of compost or planting mix so that they'll get off to a good start. And if you have any poppy buds in the garden before the guests arrive, cut them and sear the ends of the stem with a flame. They'll live in a vase for up to two weeks, opening slowly. Perennials: Usually, fall is a great time to plant small unglamorous perennials that won't bloom until spring or summer. But if you've got guests coming, you might want to splurge on a few larger plants that are ready to bloom. Think about the typical fall favorites like chrysanthemum, aster and sedum "Autumn Joy." For yellow and orange daisy-like flowers, try rudbeckia (black-eyed Susan) or gaillardia. And don't forget the many fall-blooming salvia that are available. I particularly like "Waverly," "Purple Majesty," and salvia elegans, or pineapple sage. And don't forget the perennials that look good year-round, like lavender and rosemary. Indoors: Springs bulbs are available in nurseries now. Paperwhite narcissus and hyacinth are easy to force into bloom, and both flowers grow in nothing but water and pebbles. Tulips will also do well indoors, but may not bloom in time for the holidays unless you buy bulbs that are already potted and ready for indoor use. The holidays are also a great time to splurge on orchids or carnivorous plants like pitcher plants. Both require a damp environment and look great in copper trays or glass hurricane lamp-style vases. Also, September is a good time to dry some flowers for holiday arrangements: In my garden, I've been cutting yarrow, feverfew, and lavender and hanging them upside down to dry. Finally, don't be afraid to rely on foliage for flower arrangements. Think beyond the traditional holly and evergreens to rosemary, artemesia, scented geranium and dramatic leaves like calla lily. Preparing the Garden: No matter what else you might do to get the garden ready for the holidays, fall is a great time to pull out summer annuals, cut back spent blossoms, and stay on top of the weeds that will start sprouting during the rainy season. Add as much mulch or compost as you can to protect roots and keep weeds down, and feed plants a low-nitrogen fertilizer to encourage them to put their energy into roots and bud formation. Bone meal, dolomite limestone and greensand are all good organic fertilizers to try this time of year. Vegetable Garden: Oh yeah, I guess my family's going to want something to eat, too. Since they're driving all the way up to Eureka for a meal, I should reward them with some produce from the garden. Three of the four vegetable beds will be planted in cover crops by the time they arrive, but I'll leave one in production for fall produce. Mache (corn salad) is a sweet cold-season lettuce that's almost never available in the grocery store; I'm starting some from seed and planting a row of golden beets for a roasted beet and goat cheese salad. Baby turnips and carrots might just make it in time for a dish of honey-glazed root vegetables, and although it's probably too late for Brussels sprouts, I'll plant some anyway and enjoy them later in the winter. (If you've never had fresh-picked Brussels sprouts and shallots braised in red wine, you haven't lived. Trust me, this is a vegetable that deserves a second chance.) Chard, kale, spinach and broccoli are also good choices for fall gardens. Cool season herbs like parsley, cilantro, and chervil can be ready in time for the holiday, and if you haven't planted any perennial herbs like thyme, tarragon and oregano, now's the time. As the sole vegetarian in the family, I'm off the hook for the Thanksgiving turkey. The bird will come pre-cooked from Murphy's, but at least I'll be able to take credit for the carrots and the flower arrangements. garden-related announcements and news to Amy Stewart. © Copyright 2003, North Coast Journal, Inc.